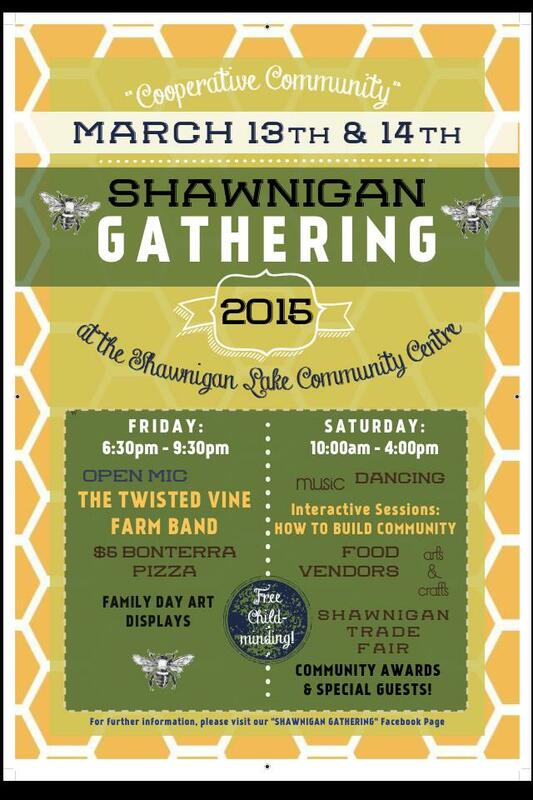 You will not want to miss this year’s Shawnigan Gathering! Friday night will feature a showcase of local talent at the open mic session, followed by the beautiful harmonies of the Twisted Vine Farm Band. There will be Bonterra Pizza available for $5, so bring the family and make a festive evening of it. On Saturday, we will begin with introductions and community awards – come out at 10:00 to join us in recognizing the people who make a positive difference in Shawnigan. At 11:00, Co-Design from Vancouver will lead us through an interactive community design process, as we re-launch our efforts to create a shared vision for the Elsie Miles Community Park. At 12:30, Rick Juliusson will tell us about how Cowichan Station created a thriving community centre at the HUB, and he will also inform us about the Cowichan Food Cooperative (the Cow-Op). Join Cavan Gates and Sandra Mark from Christina Lake at 1:00 pm as they explain how their small community is creating big change with a Cooperative investment fund. Our own Trina Burns will present at 2:30, telling us how entrepreneurs in Shawnigan Lake are creating a cooperative business model. At 3:15, Rob Douglas will share with us the success stories of the Cowichan Elder Co-op. Finally, at 3:45, watch for a very exciting announcement that will launch Shawnigan into its own cooperative adventure. Throughout the day there will be delightful musical entertainment and interactive dancing. It will be a wonderful and inspiring event. See you there!